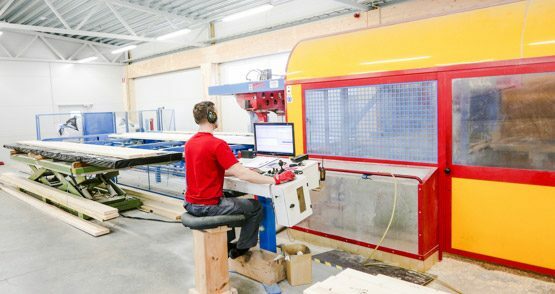 Modern, fully automatic CNC robotics, experienced specialists and international standards for construction and ISO 9001: 2015 quality standards are based on Timbeco Woodhouse’s production of high quality structural elements and modules. 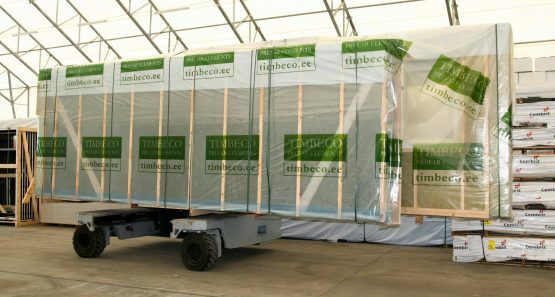 Compared to many competitors, Timbeco has the advantage of cutting-edge industrial equipment and a significantly higher value chain, as Timbecos’s valuation of wood begins with the processing of dried lumber. 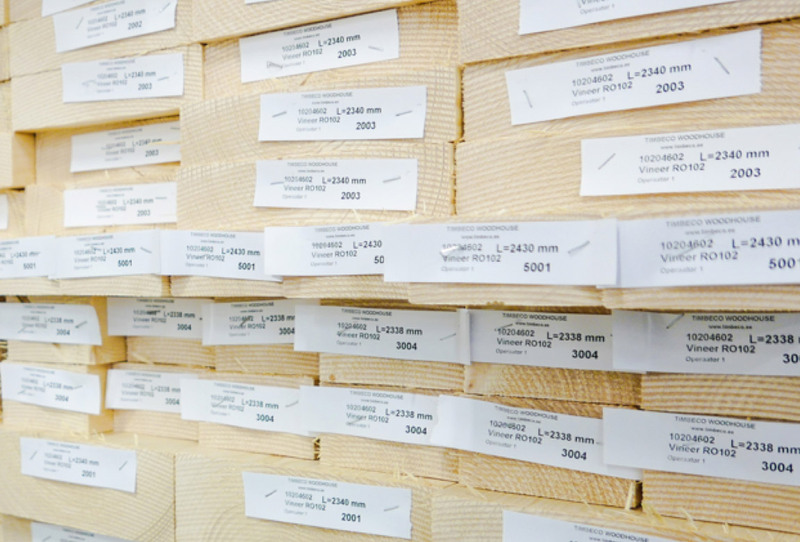 We do not buy calibrated (planed) material in the same way as many rivals, but we buy high-quality dry lumber, from which we (calibrating, tightening, calibrating and planing) produce the necessary cross-sectional material. 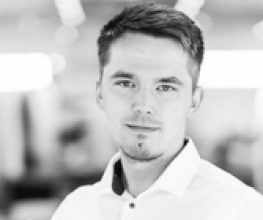 Thanks to a significantly longer supply chain, we are able to offer our customers faster delivery times, more flexible cross-sectional and lining choices, all at a more affordable price. 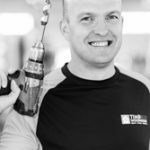 We are less dependent on other suppliers, and we can therefore offer our customers greater security of supply. 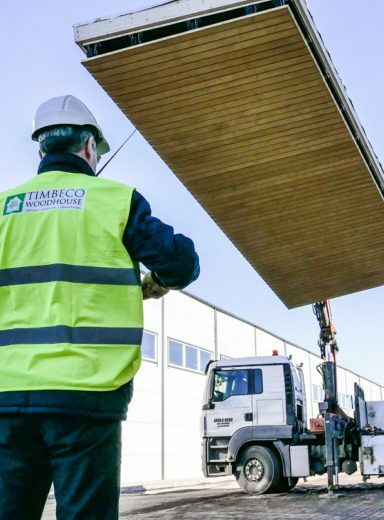 Therefore, Timbecos believes that the best quality wood material can be guaranteed if the wood-based company itself covers as much wood processing as possible in the value chain. 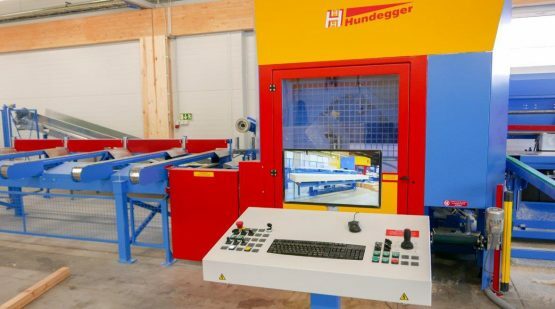 Fully automated CNC machine for the manufacture of wooden houses – Hundegger K2 is one of the world’s leading fully automated CNC wood processing centres intended for the manufacture of wooden details which is also suitable for producing the most complex solutions. The house is engineered with 3D programmes (AutoCad, HsbCad, etc.) 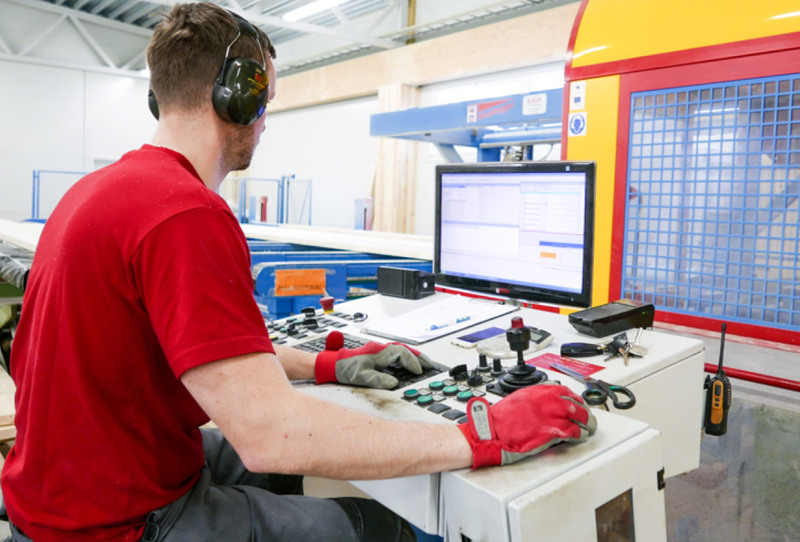 and the design is sent electronically to the main machine of Hundegger K2 and is used for the manufacture of wooden details in the CNC wood processing centre. Speed-Cut SC-3 is mainly designed for fast and accurate cutting, as well as simpler processing (drilling, milling, marking). 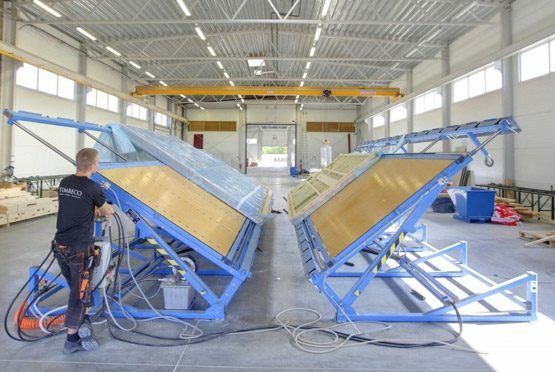 The device allows wood to be processed with a cross section of 20 x 40 mm to 160 x 450 mm. Speed Cut has two conveyor systems that work independently of each other; it allows for fast and accurate wood handling and very short processing times without re-adjusting. 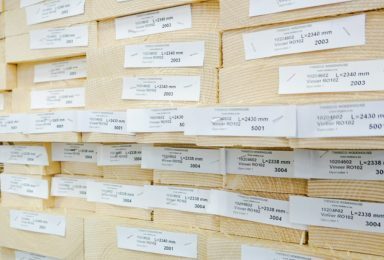 One of our greatest advantages over other wooden house manufacturers is the fact that approximately 90% of the planed wooden materials used to construct our houses are manufactured by the factory (not purchased) and thanks to that we can offer our customers the best quality and control over the supply chain from the beginning to the end.In addition to milled log walls and wooden frames, we also manufacture other planed materials for walls, ceilings, wooden frame walls, roof structures, terraces and balconies. 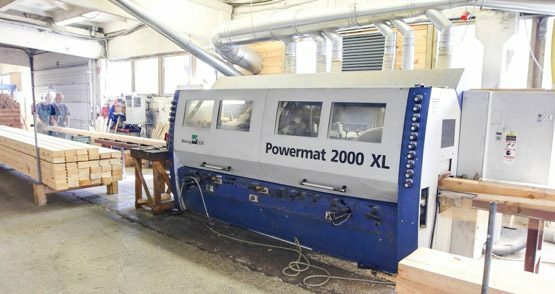 We use the Weinig Powermat 2000 XL 4-sided planer to plane our material to meet the top quality. The 6 spindles of the 4-sided planer reach 10,000 rpm which ensure the perfect surface of the wood. Planing different profiles is trouble-free, since replacing the planer’s PowerLock tools/cutting edges only takes a few seconds. 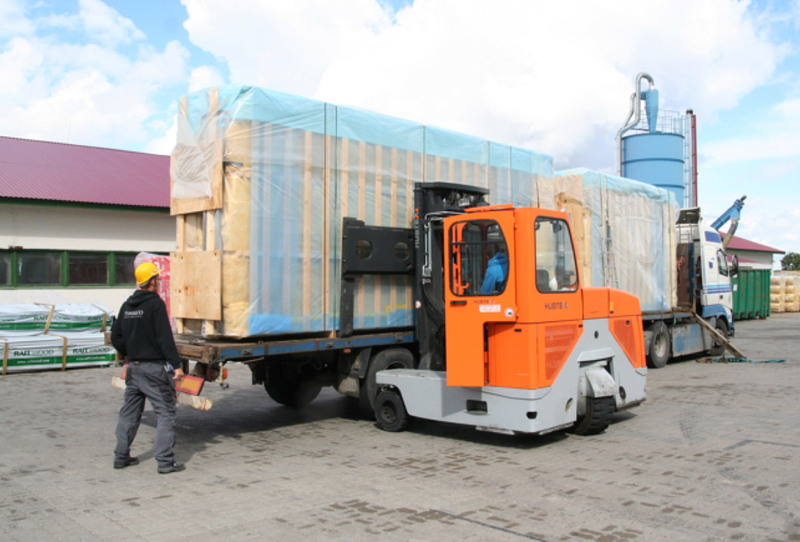 Depending on the profile, the planer capacity can be up to 60 metres per minute. 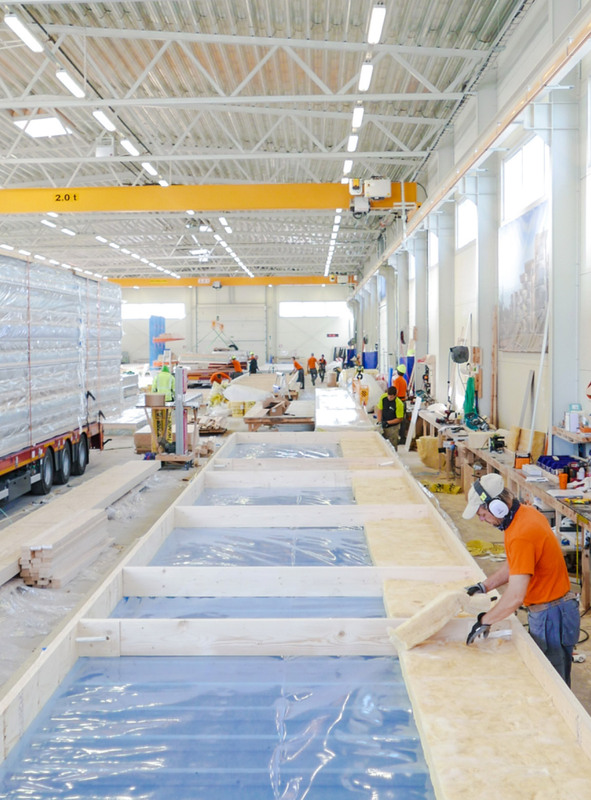 The average planed material volume during an 8-hour shift is approximately 20,000 metres. Timbeco manufactures prefabricated timber frame elements on top-level assembly tables Randek BS 20 l.
The high quality of our prefabricated elements is achieved thanks to the automatic compression and rearrangement function of Randek BS 20 butterfly tables, which, in addition to high speed, also ensure the rigidity and stability of the details. 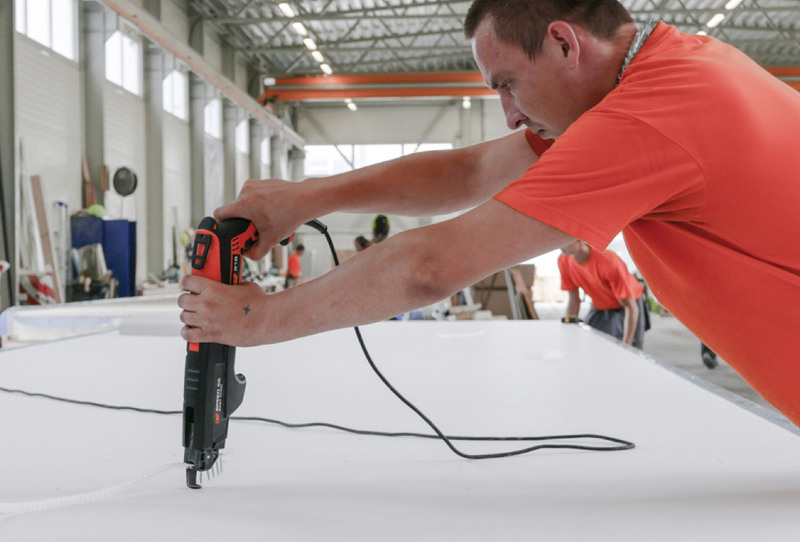 The assembly tables of Randek BS 20 are functional and allow to produce elements of various lengths, thicknesses and widths. 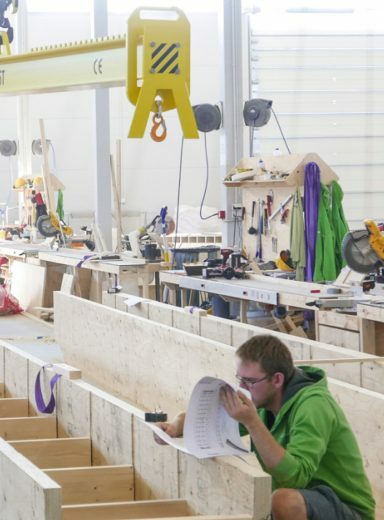 The maximum dimensions of the provided elements are 3 x 12 m.
Finished and machined details of the CNC tension ensure the exact conformity of the finished element with the drawings and the subsequent problem-free installation. The materials that are painted are more rigid and stronger than usual, and are better off against transport, loading and lifting. Production is testing and is also responsible for all material supplied to the house that the factory itself does not produce. 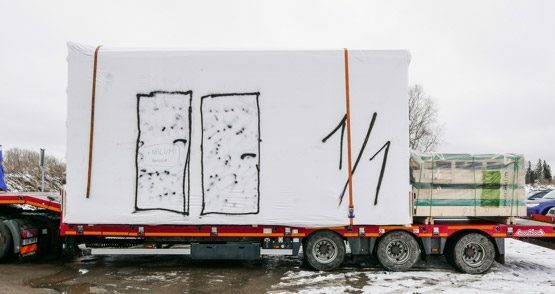 A great advantage is that all materials and constructions of the building are protected against weathering in the dry rooms of the factory, and they have been given a great deal of attention in packaging. 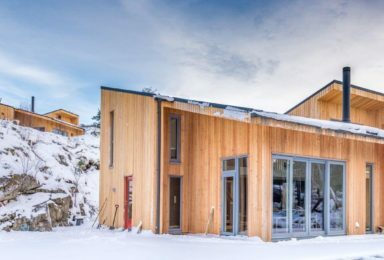 Element houses have the advantage of independent seasons, which allows building elements to be built throughout the year. Before shipment of the modules from the factory to the object, they are covered with a heat-shrinkable film coating that helps protect them from rain, wind and sun. Modules are delivered to the construction site by truck. In order to verify the suitability of the materials in the materials, the visual appearance and the compliance with the design, we are ready to produce sample elements. 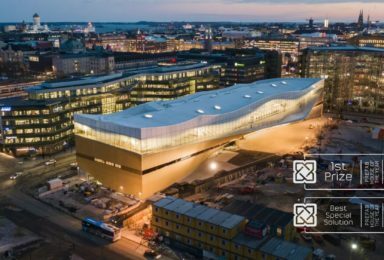 It provides certainty for large projects that the materials used and the components of the building meet the requirements.